A Fredericksburg Texas vacation makes a great Austin, San Antonio or Dallas weekend getaway. It is also a fun stop on a Texas getaway that includes Austin and/or San Antonio. You will notice ornate Victorian architecture around town. 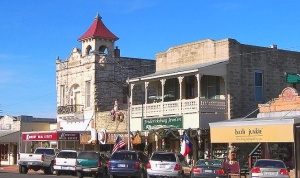 This Texas Hill Country pioneer town was settled by German immigrants in 1840 and still maintains an obvious German influence. This is an excellent base for Texas weekend getaways. Consider relaxing girlfriend getaways or romantic weekend getaways in Fredericksburg. You will find wineries, lavender fields, theatres, museums, art galleries, over 100 shops and lots of great bed and breakfasts. For family getaways, add to the above....hiking, fishing, nearby tubing and water park, horseback riding, golf, biking, swimming and more. When to go? 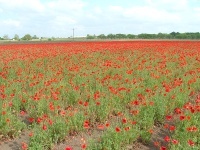 - Each season has its advantages for a Fredericksburg Texas vacation. Spring is Texas wildflower and bluebonnet peak, summer lavender is blooming and peaches are plentiful, fall brings Octoberfest and the harvesting of grapes and winter is the traditional German Christmas Market. Below you will find the best choices in Fredericksburg Tx lodging including hotels, inns, bed & breakfast and vacation rentals. Hangar Hotel - unique hotel at the small airport in Fredericksburg, 40s style, not suitable for kids as there is no pool or activities. Hampton Inn Suites Fredericksburg - dependable brand hotel with nice rooms, pool and breakfast....great for a family. Read reviews and check rates for these Fredericksburg B&Bs and more. Have you thought about trying a Texas vacation rental? Basing yourself in a Fredericksburg vacation rental, cottage or cabin is the perfect choice for the best family vacation in Texas, girlfriend weekend or family reunion. If you are looking for romantic Texas vacation rentals, here is a Fredericksburg rental to check out. This charming 1 bedroom has hot tub, fireplace, screen porch and 42" plasma TV....perfect for a Fredericksburg honeymoon or anniversary! Check out this complete listing and reviews of vacation rentals in Fredericksburg Texas Hill Country. Rock Box Theater - live show with great music makes for a fun and unique evening on your Fredericksburg Texas vacation. Enchanted Rock State Park - a huge pink granite dome, one of the largest underground rock formations uncovered by erosion in the U.S.
For a romantic weekend getaway, try The Nest Restaurant which has fine food in an elegant setting or the lovely Rosehill Manor Restaurant (see above). Kelly's located west of downtown is in a charming bungalow. A nice place for lunch is at Altdorf's on the patio or Rather Sweet Bakery and Cafe. If you want to try some German food, consider Friedhelm's Bavaian Inn (above), The Auslander or Altdorf Biergarten. There are plenty of options for shopping on your Fredericksburg Texas vacation, especially those girlfriend getaways. A few unique ideas...Dooley's 5 10 & 25 is a fun, antique dollar store, Artisans at Rocky Hill for local art and crafts or Antique Mall of Fredericksburg or Lone Star Antique Mall for antique lovers. Have you been to Fredericksburg before? Do you have a favorite hotel or attraction that everyone should know about?